Qualcomm CMO Anand Chandrasekher has bashed rival chipmaker Nvidia's Tegra processors. Tegra 3 quad-core processors power most of 2012's most popular Android tablets. The exec says he believes Qualcomm's own upcoming 600 and 800 processors will blow the Tegra series out of the water, and dominate the market. On the smartphone side, the Qualcomm Snapdragon S4 series is completely dominant, thanks to its great power performance and smart battery performance. 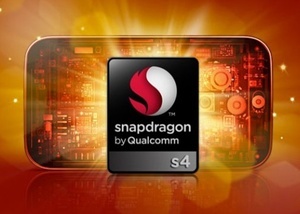 "Snapdragon S4 Pro is better, faster than the commercially shipping Tegra 3...On benchmarks published by Anantech, S4 Pro is twice as fast as the fastest Tegra processor commercially available. Nvidia just launched their Tegra 4 – not sure when those will be in the market on a commercial basis, but we believe our Snapdragon 600 outperforms Nvidia's Tegra 4. And we believe our Snapdragon 800 completely outstrips it and puts a new benchmark in place," says Chandrasekher. The exec then went for the throat: "So, we clean Tegra 4's clock. There's nothing in Tegra 4 that we looked at and that looks interesting. Tegra 4, frankly, looks a lot like what we already have in S4 Pro... Yes, they [Nvidia] had the perception [of superior graphics] help[ing] them for some time, and that helped them for some tablet wins. I think that would change. The world is increasingly becoming aware that what we have in CPUs and graphics is beyond what anybody has. So usually, that technical awareness happens at the OEMs, and that takes a while for products to emerge...Empirically, we completely beat them on graphics performance!" Execute what your mouth shoots off; I not saying they didn't slaughter benches, but I want to see their chips perform on a device I can hold in my hands. It's the very reason I haven't bought a new tablet or cell; I been waiting for this moment for all companies to bring out their best and have it implemented in the tech that matters. Until then, talk all you want, but focus on praising your own products rather than trash talking the competition; it's more professional and chances are your business partners will take you more seriously.